The Polo now packs a smaller 1.0 petrol engine and continues with the 1.2 turbo-petrol and 1.5 diesel as before. See how it stacks up against its rivals. The Volkswagen Polo has been around for a long time, and now, in a bid to make it appeal more to efficiency-oriented buyers, VW has equipped its hatchback with a smaller, 1.0-litre MPI petrol engine. As before, Polo buyers also have the option of a DSG gearbox-equipped 1.2-litre turbo-petrol version as well as a 1.5 diesel model. Time to see how it sizes up against its rivals - the Maruti Suzuki Swift and the Hyundai Grand i10 - on paper. At 3,971mm, the Polo is the longest of the three, but the new Swift is both wider and taller. With kerb weight pegged at 1,015kg for the base petrol all the way up to 1,163kg for the top-spec diesel, the Polo is heavier than the Grand i10, and significantly heavier than the Swift, which weighs between 855kg and 985kg. Also, now just two years away from completing a full decade in India, the Polo, while still a smart-looking car, is now starting to show its age in the face of newer competition. 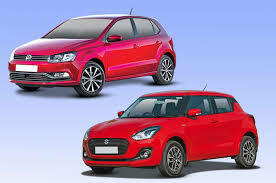 The VW and Hyundai get black and beige interiors, while the Maruti's insides are done up entirely in black. Despite being the longest car (and the one with the biggest wheelbase) here, the Polo doesn't exactly excel at interior space, and it is the Swift that is the most spacious of the lot. That said, the Polo has the biggest boot, at 294 litres. Like the Swift, the Polo gets ABS and two airbags as standard on even the base variant. The Grand i10, meanwhile, gets ABS only in its top two trims. Volkswagen has replaced the Polo's 1.2-litre MPI petrol engine with a 1.0-litre, three-cylinder example making 76hp (1hp more than the 1.2) and 95Nm of torque, which is 15Nm less than the 1.2. In comparison, the Grand i10 and Swift both come with a 1.2-litre, four-cylinder petrol engine, with the Grand i10's making 83hp and 114Nm, and the Swift's developing 83hp and 115Nm. The Polo's smaller engine is 18kg lighter than the 1.2, and at a claimed 18.78kpl, more efficient as well. However, it's still not close to the Grand i10 (19.7kpl) and the Swift (22kpl). Bearing in mind the heft of the Polo, the drop in torque may negatively impact its performance. When it comes to the diesels, the Polo's 1.5-litre, four-cylinder unit is the biggest, most powerful here: it makes 90hp and 230Nm of torque, beating the Swift's 1.3-litre diesel (75hp, 190Nm) and the Grand i10's 1.2-litre, three-cylinder engine (75hp, 190Nm). All three models are offered with automatic transmissions, though only the Swift is available with the option in both petrol and diesel form, albeit a relatively basic but efficient AMT setup. The Hyundai Grand i10 petrol comes with the option of a torque converter while the automatic version of the Polo uses a 105hp, 1.2-litre turbo-petrol engine mated to a sophisticated seven-speed dual clutch transmission. Despite introducing a smaller engine, Volkswagen hasn't cut the Polo's price, so it still starts at Rs 5.41 lakh (ex-showroom, Delhi), which is about Rs 41,000 more than the base Swift petrol, and close to Rs 70,000 more than the entry-level Grand i10 petrol. The Polo 1.0 petrol-manual range closes out at Rs 7.24 lakh for the Highline Plus, a mere Rs 5,000 less than the fully-loaded Swift ZXi+, and Rs 71,000 more than the top-spec Grand i10 Asta. The hot GT petrol version of the Polo, the TSI, is priced at Rs 9.19 lakh. The gap widens when you bring diesel into the picture. At Rs 6.92 lakh, the base Polo diesel is almost a lakh more expensive than the others. At Rs 8.78 lakh, the top-of-the-line Polo Highline Plus is nearly Rs 50,000 dearer than the Swift ZDi+, and Rs 1.27 lakh more than the Grand i10 Asta CRDi. With the more powerful GT TDI, the gap widens even further, as it costs Rs 9.33 lakh.